Did the IRS, the same federal agency that five years ago targeted conservative groups, allow the Clinton Foundation a pass on compliance requirements? Clinton Foundation officials “skirted or ignored federal laws and regulations” while converting the non-profit from its tax-exempt purpose of building a presidential library in Little Rock, according to documents reviewed by The Daily Caller News Foundation. 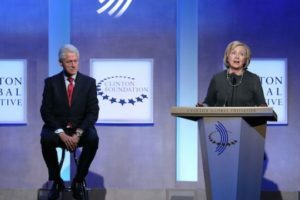 The Clinton Foundation “has never been validly authorized to pursue tax-exempt purposes other than as a presidential archive,” an analyst said. The Clinton Foundation did not comply. The Clinton Presidential Library and Museum was dedicated in Little Rock on Nov. 18, 2004. The Clinton Foundation has raised an estimated $1.5 billion since 2004. Meanwhile, IRS officials knew the agency was targeting conservative organizations seeking tax-exempt status based on their ideology and political affiliation two years before disclosing it to Congress and the public, according to documents released in July of this year. Non-profit foundations are required by the IRS to conduct activities that support the officially approved tax-exempt purpose for which the federal agency allows them to offer donors the ability to deduct contributions. Officials must report annually via the IRS Tax Form 990 to show their non-profit’s compliance with its exempt purpose.